1975, Suffolk University School of Law in Boston, Massachusetts, J.D. 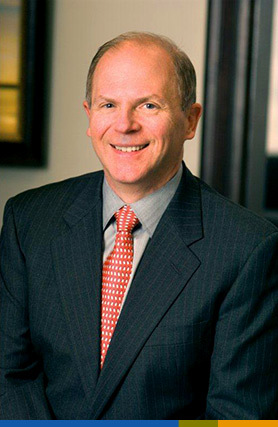 An expert in the areas of corporate, securities and financial institution matters, including complex corporate and banking mergers, acquisitions and reorganizations, securities offerings (both public and private placements), and proxy contests, Mr. Perry has been lead counsel and strategist on numerous complex supervisory and non-supervisory acquisitions involving both foreign and domestic acquirers. Before joining the Firm, Mr. Perry oversaw the operation of Hovde Capital Advisors and all legal matters, including compliance, involving Hovde Capital Advisors and its affiliates. Skilled and experienced in the structuring and negotiating of transactions, Mr. Perry was involved in the negotiations of various acquisitions made by merchant banking and investment fund affiliates. Prior to joining the Hovde organization in 1997, Mr. Perry served as outside counsel while he was a partner in the law firm of Perry, Simmons & Loots, P.C. in Washington, D.C., where his area of concentration was Banking, Corporate and Securities Law. Mr. Perry was previously in-house counsel of a large New England thrift, Executive Assistant to the Chairman of the Federal Home Loan Bank Board (later the Office of Thrift Supervision), and Partner in charge of several East Coast financial institution practice groups for the national law firms of McKenna, Conner & Cuneo, Baker & Hostetler (where he also served on the D.C. Office Management Committee), and Hogan & Hartson. Mr. Perry was the recipient of the McGowan Award for outstanding scholastic achievement and public service. In his charitable endeavors, Mr. Perry has served as the Treasurer of the Special Olympics and actively supports and participates in numerous civic and humanitarian organizations.